No doubt, by now you have the menu planned for Easter and have bought what you need. If not, here’s a popular Gallic choice: gigot d’agneau, leg of lamb. It’s a firmly established French tradition, and there is rarely much deviation. But, to mangle the title of a nearly 100-year-old song, 50 million French carnivores can’t be wrong. Interviewing French friends and perusing a few popular French cooking magazines confirms that the classic Easter menu begins with asparagus, moves to the lamb course and ends with chocolates, typically egg-shaped. 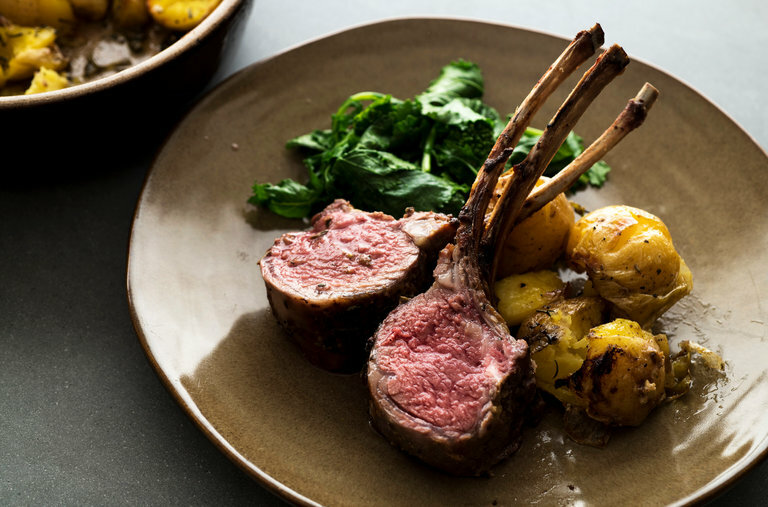 One headline pronounced: “Easter without lamb is like Christmas without bûche de Noël!” After a warning to avoid overcooking it (“too cooked, it loses its tenderness and finesse”) were 48 recipes for leg of lamb in various guises. Another magazine offered 60. 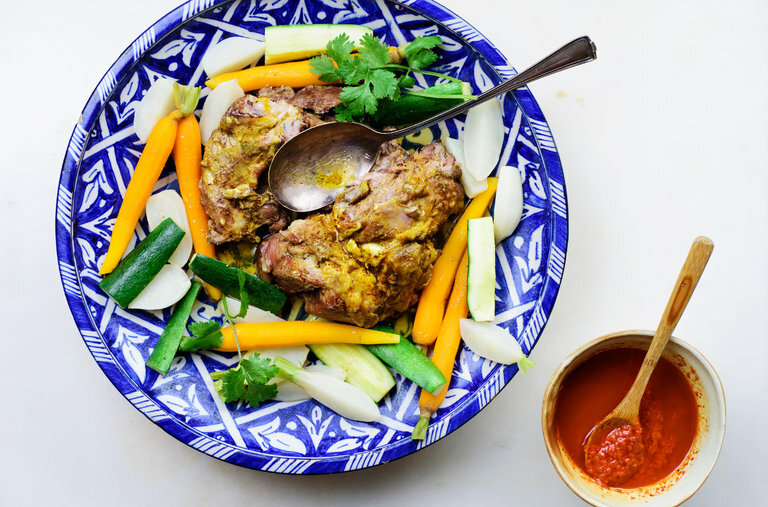 Not everyone cooks the leg, of course, but nearly everyone eats some kind of lamb dish, whether braised with spring vegetables or cut into chops and pan-seared. 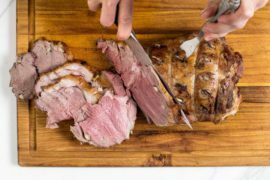 But leg of lamb doesn’t have to be reserved for just Easter: It’s appropriate for any special dinner party, or any occasion when you want an impressive main course. The technique is simple, but the result is very flavorful. Throughout France, the standard way to prepare a leg of lamb, after first asking the butcher to trim away excess fat, remove the hip bone and tie it up, is to make a couple dozen little slits in the surface of the roast with a sharp knife. Into each, you insert a small garlic clove, or a garlic sliver, if the cloves are large. Then, you shower it all over with salt and pepper and massage the seasoning into the meat. 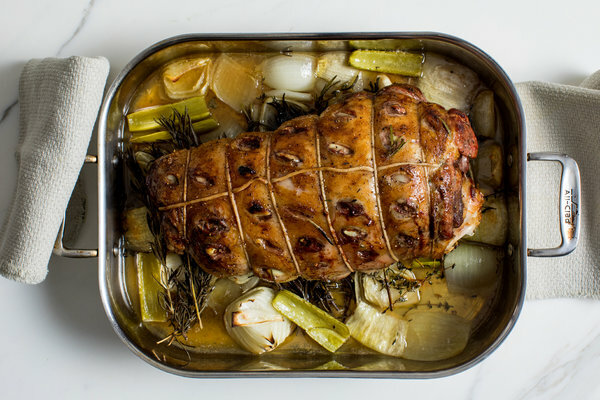 I like to line the roasting pan with a hefty pile of thyme and rosemary branches to perfume the lamb as it roasts. Leg of lamb and beans is a classic combination, one I admire. In France, dried flageolet beans, small and pale green, are a common accompaniment, or fat dried white coco beans. I often use cannellini or gigante beans. The mingling of rich pan juices with the soft creamy beans is rather intoxicating. Serve this festive leg of lamb and beans combination all year round, along with whatever seasonal vegetables you fancy. Right now, for instance, buttered baby carrots or turnips seem perfect to me, as I anticipate the arrival of peas, asparagus and ramps at the market. And, far off on the horizon, the Francophile fantasy — ratatouille — awaits.